It is a short drive from Lihu’e or Kapa’a to the Po’ipu Beach area, which is on the south shore of Kaua’i. Along the way, drive down the mile of Eucalyptus trees, growing tunnel-like on both sides of the road. Old Koloa town makes for an interesting stop, with lots of shops to browse through. It’s just like stepping back 50 years in time to an old sugar mill town. I bought some Kaua’i coffee here, but red dirt t-shirts are also very popular items. Coffee growing on Kaua’i is a relatively new venture, however the quality is starting to rival the more well-known Kona coffee grown on the Big Island. On to Po’ipu Beach, where there are many condos and luxury resorts with spectacular ocean views and golf courses, and then on to the blowhole at Spouting Horn Park. The return trip took us past an abandoned sugar mill, near Koloa. Notice the famous red dirt, which is so fertile for growing sugar cane. The main sugar mill in Lihu’e was closed in 2000, leaving only one sugar mill running on Kaua’i near Port Allen. The sugar industry on Hawai’i is slowly being put out of business. They will have to find another agricultural crop to grow, or find some other use for this very fertile land. One restaurant on Kaua’i I must mention is Gaylord’s Restaurant, located in the main building of Kilohana Plantation Estates (an old sugar plantation). There are some very nice shops in this same building, and they offer some quality merchandise, should you be so inclined. The restaurant service is impeccable, and the food is superb. Reservations accepted. Highly recommended! We dock in Nawiliwili this afternoon at 5:20pm (Sept 29th), and don’t leave port until the following afternoon. The Rotterdam is also docked as we arrive. She departs about an hour later – a lovely sight. As our gangway is put in place, complete with red carpet, a rain shower starts up – “welcome to Kauai”. We all stay aboard the ship this evening. 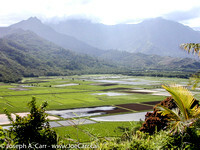 The following day, we decide to drive up the eastern and northern coasts of Kauai to a bit past the Hanalei Valley. We stop for a swim near Anini Beach and to see the Kilauea Lighthouse, and are back into town by 3pm and back onboard the ship by 3:30pm…well ahead of the 4:30pm All Aboard deadline. My friends and I have visited Kauai before, so this visit brings back good memories for all of us, and was a most enjoyable day. 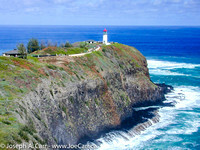 If you are staying on the east coast of Kaua’i, the drive to the west coast make a nice day trip by car. The only working sugar mill is located at Port Allen, and they offer tours. Call ahead, since the tours are limited. Hanapepe and Waimea are agricultural centers for sugar cane, and both towns have boat harbors. Salt Pond Beach Park is just off the highway at Hanapepe – follow the signs. A nice beach for all ages, basic facilities, and limited camping. The little town of Waimea is the gateway to the Waimea Canyon, which is a “must see” while you are on Kaua’i. There are two roads to Waimea Canyon, but I would recommend the Kokee Road, which is a right turn 3.6 miles past the town of Waimea. The sign is easy to spot from the highway. Just follow this very steep road with lots of curves, and stop at the lookouts along the way. Take your time, and enjoy the views along the way. After you leave the main highway, there are no gas stations or facilities other than a primitive bathroom at the main lookout, so take your own water and food, and fill the car with gas. This side of Kaua’i is very dry, and if there was no irrigation, no productive crops would be possible. Irrigation ditches were established by the Robinson family when they originally acquired this land from the Hawaiians, and these ditches are still in use today. 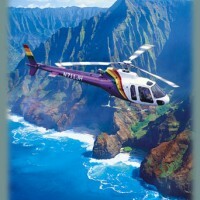 They can be seen from the air and you can catch glimpses of them from the Waimea Canyon roads. 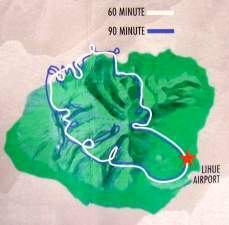 Barking Sands is a missile testing range, and military airport. Restricted access is usually granted to civilians if you provide identification. Major’s Bay is worth visiting, but is inside Barking Sands, so you will need ID. Further along is the longest sand beach with the fewest people on it you will find anywhere in Hawaii! If you are adventurous, drive to the end of the Kaumuali’i Highway past Barking Sands base, and drive five miles further along the coast to Polihale State Park. This is as far as you can travel by car along the west side of the Na Pali Coast, and your car rental company may forbid you to go here. This botanical garden is located in Ha’ena, near the end of the north shore road. Be sure to allow yourself over an hour (two hours is better) to explore these botanical gardens. You don’t have to be interested in plants to appreciate the rare window to ancient Hawai’i which Limahuli Gardens offers its visitors. Only basic facilities are available: composting toilets are located at the visitors’ center, drinking water is supplied along the way, and a guide book is part of the modest admission fee. Mosquitoes can be a problem in this wet area (Skin-So-Soft is provided), and rain showers are frequent but usually brief (ponchos and umbrellas are provided). Please stay on the well-marked pathway provided, and be sure to stay hydrated by sipping water from each station where it is provided for your use. Parts of the path are steep, and may not be suitable for those with mobility issues or certain medical conditions. Access beyond the parking lot for those who have limited mobility can be a problem, so check with the facility for current info. Makana Mountain towers above Lumahuli, and was given the name Bali Hai by the producers of the movie South Pacific. In Hawaiian “Makana” means “gift”, giving us a clue to the importance of this mountain in ancient Hawaiian life. Makana was used for the ‘oahi fire-throwing ceremony, where light, dry logs were set aflame and flung off the mountaintop. The strong winds would carry the firebrands as far as a mile out to sea. This ceremony was reserved for very special occasions. Pohaku-o-Kane means Stone of Kane. Ancient Hawaiian legend tells us this rock is very significant. Kane (the rock) and his brother and sister were rolling around on the ocean floor long before humans inhabited Hawaii. They all liked Kaua’i and decided to stay here. His brother and sister fell asleep on the shore nearby, but this rock was determined to climb to the top of the ridge. He tried and tried, but each time he fell back until Kane (a Hawaiian god) helped him to the top of the mountain ridge. In return, the rock promised to remain awake and watchful, and report everything he saw to Kane. Personally, I believe the legend – what other explanation can there be for such a large rock to be perched so precariously atop a high ridge, and remain there for so long? Lumahuli is a special place which gives me good feelings. Take the opportunity to rest for awhile at the Lookout. Gaze around to fully appreciate the natural beauty, and soak up some of your own good feelings from this place to carry with you in your travels through these special islands. Kilauea Point National Wildlife Refuge, is north of Kapa’a on the Kuhio Highway. Watch for the signs and turn right to get to Kilauea Point and the little community. There is no entrance fee, but please drop a donation in the boxes provided. The lighthouse grounds can be home to wildlife. We found an Albatross on a nest, and the nearby cliffs are covered with nesting Shearwaters, Red Boobys, and Laysan Albatrosses. Kilauea Point is the most northerly point on Kaua’i, and Kaua’i is the most northerly of the Hawaiian Islands, so I assume this why the birds find this a good location for nesting. I also spotted a flock of about 6 Nene Geese (native Hawaiian goose). When the Trade Winds are high, this area around Kilauea Point experiences huge surf, causing some spectacular wave action. Moku ‘Ae’ae Islet and blowhole is a sight to see just off Kilauea Point. There is a small community at the turnoff to Kilauea Point, and I would recommend Kong Lung – a funky store filled with unusual gifts some might be interested in. I also recommend the Lighthouse Bistro for lunch or dinner (located beside Kong Lung). You can’t go wrong ordering their fresh fish of the day. Very good food – highly recommended. Just past Kilauea Point is Anini Beach County Park. This is a good spot for a picnic lunch, and the fantastic white sand beach is rarely crowded. Anini Beach would make an ideal destination for a whole day’s outing, since it one of the safest for swimming (not too common on Kaua’i due to the offshore reef), and it has good picnic facilities. Another good beach just past Kikauea Point is Kalihiwi Bay. As you can see by the photos, the surf was up while I was visiting in January 2001, so no swimming was possible. The surfers were certainly out there riding the waves, although the emergency rescue was called while I was there, so it was even a bit too rough for some of the surfers! Princeville is the next community along the North Coast. It is one of those planned communities, which are so common in Hawaii. Everything revolves around the superb golf courses, and yet I find all of them so sterile and cold. No doubt the exclusive properties are very expensive to purchase, and yet they hold no appeal to me whatsoever. Past Princeville is the Hanalei Valley, which is very picturesque. Hanalei is a small community located on a superb little bay with the same name. The valley is rich and fertile, and many crops are grown here, including lots of taro. Needless to say, there is a great deal of rainfall in this area. Hanalei Bay can experience spectacular surf when the winds are high. If you rent a kayak, stick to the inland waterways. Ha’ena Beach (aka Tunnels Beach) is normally calm and is a good beach for swimming and snorkelling, but as you can see by my photos, the surf can get very high. Ke’e Beach is much smaller than Tunnel Beach, but it is the end of the north shore road. While you are there, have a look at the Waikanaloa Wet Cave. Near the end of the North Shore road is the Limahuli Gardens, but they deserve their own article! As mentioned on the main Kaua’i page, I stayed at Kakalina’s Bed & Breakfast for the week I spent on Kaua’i in 2001. Kathy still runs this B&B, and it continues to get high ratings. Before leaving Lihue, take the Ma’alo Road (near the old sugar mill) and drive the short distance to see Wailua Falls. Afterward, proceed northward along the east coast of Kaua’i along the Kuhio Highway. First stop is the spectacular Opaeka’a Falls, and the view of the Wailua River across the road from the falls lookout. If you continue driving up the road to the end, you will find the Keahua Arboretum. I would not recommend taking the boat cruises along the Wailua River. The fern grotto and other sights along the way are underwhelming, although Tripadvisor gives these cruises high marks, so some may like it. The best way to see the Wailua River and falls is to drive to the lookouts on the hills surrounding the river valley (easy), and ideally take a helicopter tour of the whole island (expensive). The Poliahu Heiau is adjacent to Opaeka’a Falls. Heiaus (or temples) are holy places for Hawaiians, and were used extensively by the ancient Hawaiians. Most heiaus consist of rock walls, and platforms made of rock. Spiritual leaders ensured that the mana (spiritual power) was respected by all, and they also enforced the kapu (sacred rules of life). For more info on Hawaiian sacred places, please refer to a more extensive discussion off my Big Island page which highlights Puuhonua o Honaunau. Next up the highway, is the town of Kapa’a. This is a good place to pick up snack food, fruit and drinks, all at reasonable prices. Pono Market – hot & cold food to go & sushi – inexpensive & good – where the locals shop for takeout! This place continues to be a must-try according to the enthusiastic Yelp reviews. ABC Store – best place to buy cold beverages and snacks, and the best prices on the standard Hawaiian souvenirs. Farmers’ Markets – If you want the freshest food, and delicious local snacks, you need to find a local farmers’ market! There are some restaurants scattered along the eastern shoreline of Kaua’i, and they are worth finding and trying out, since many cater more to the locals than tourists. There are resorts along the east coast, but they tend to be more modest than those you will find elsewhere on Kaua’i. There are also many public beaches along the eastern shoreline. They are well worth exploring, since they are less crowded than other areas of the island. In particular, Anini Beach is a great spot to spend the day after picking up your picnic lunch in Kapa’a.